If you are having a hard time making a choice between a 1BR apartment [SSH] and 2BR apartment [SSH2BR], then here is your choice. This roomy 1 Bedroom unit comes with a separate living room with an audio system and a double sized sofa bed, which serves as a large sofa in day time, and converts to a double sized bed whenever you need. 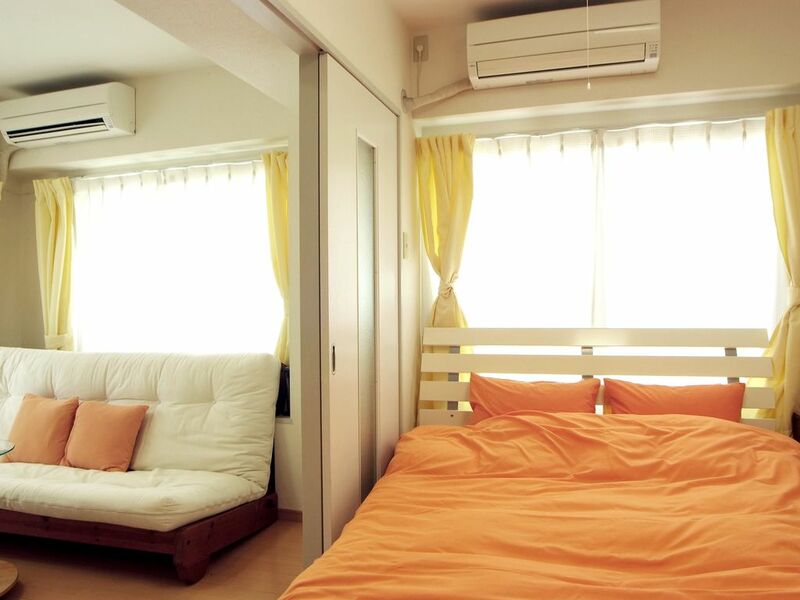 The bedroom has a double sized bed, and if that is still not sufficient, you can also add an extra futon set as an option. As the picture shows, there is a glass table in the dining / kitchen area, seating up to 5 people. The unit is on the upper floor, allowing the sunshine to come in through the windows in the living room. You cannot go wrong with this bright and roomy 1 bedroom. It is a 3 minute walk to Nishi-Ogikubo station, and the 24/7 supermarket is in- between. This culturally rich district is home to many cafes, antique shops and secondhand book sellers (some of them sell English books, too.) If you have never heard of this area, try it once and you will love it. Although being close to the central area of Tokyo, this neighborhood has a tranquil, homey atmosphere, and is safe and peaceful. There was a quick response to our request to fix refrigerator trouble. Within less than an hour they came in and replaced it. Thank you Mr manager. I liked everything from location to amenities．I am not complaining but it will be better if flat bed sheets are provided.